The KDEP invited the community to participate in a discussion regarding the Brownfields Cleanup Grant for the KTO Gymnasium/Community Center. 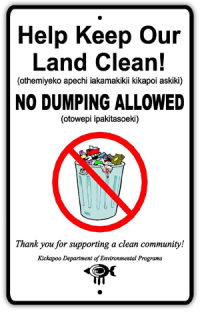 As a requirement of the grant, we are seeking comments from tribal members and community on the four proposal alternatives presented in the Brownfields Cleanup Grant handout (read here) distributed at the meeting. To submit your comments on the proposals, please use the Contact Us button to submit online, or visit the Environmental office at the Secondary Administration Building (Brown Building) by December 6, 2016. The full draft grant proposal & the Analysis of Brownfield Cleanup Alternatives will be available for review in the Kickapoo Environmental office until December 6, 2016. If you have any questions regarding the project or the meeting, please contact Darren Shields at 405.964.5967. For more information on brownfield sites, please see our Brownfield Program page.